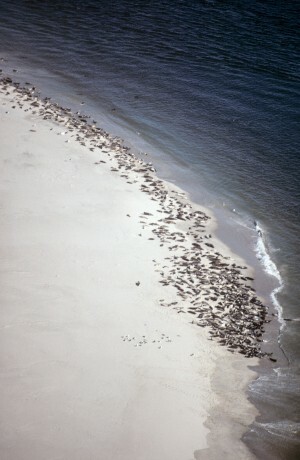 Over 700 harbor and gray seals hauled out on the Monomoy National Wildlife Refuge beach on Monomoy Island, Cape Cod. 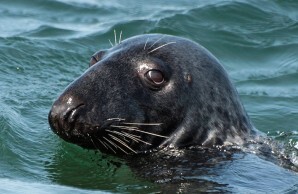 The Canadian gray seal population, though much larger than that in the U. S., has had a similar history of exploitation and recovery. Accounts by early European explorers indicate that gray seals were abundant and widely distributed along the Canadian east coast and the Gulf of St. Lawrence. These accounts describe hunting by First Nations and by European settlers from the 1500s into the early 1800s. By the mid- to late-1800s, gray seals were rare and remained so until the mid-1900s. The total Canadian gray seal population was estimated to be 5,600 animals in 1966. With the protection of marine mammals over the last 40 years, the western North Atlantic gray seal population has rebounded. 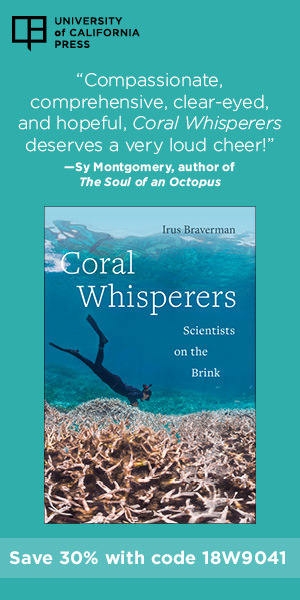 In the 1980s, naturally re-established breeding colonies were observed off the northern U. S. coast. Since 1991, three small, but increasing, breeding sites have been identified: Muskeget Island in Massachusetts and Green and Seal Islands in Maine. From 1991–2008, aerial surveys were flown over these three areas during the breeding season (December-February) to estimate the number of pups born at each site. Monomoy Island off Cape Cod was also surveyed intermittently during this period. 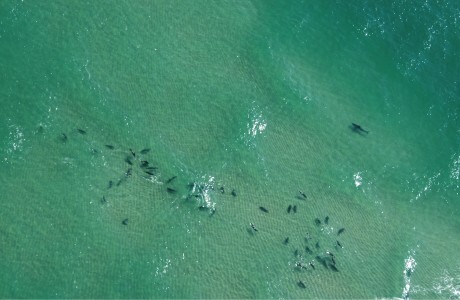 Data for the three colonies that were regularly surveyed show that a minimum of 2,620 pups were born in 2008. Stage 4 gray seal pup (left) watches as female and male mate after a half-hour courtship ritual at the Monomoy National Wildlife Refuge. Photograph was taken under the authority of NMFS MMPA Permit No. 17670; and USFWS Permit No. 53514-17-02. 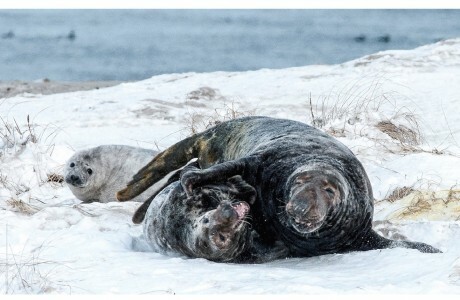 As the negative human impact on gray seal populations has faded, the re-establishment of gray seals in New England waters seems to be contributing to an increase in the presence of another threat to gray seals—the white shark (Carcharodon carcharias). In their 1985 review of white shark distribution in the western North Atlantic, John Casey and Harold Pratt, Jr., of NOAA National Marine Fisheries Service, compiled observations from numerous sources, including fisheries, confirmed sightings, and published accounts dating back to 1874. They found only 380 records. They also found that, from 1963-1983, white sharks represented only 0.04 percent of the sharks taken by over 2.1 million hooks by pelagic longline commercial fishing from the Grand Banks to the Gulf of Mexico. Nonetheless, Casey and Pratt concluded that white sharks in the western North Atlantic were most abundant on the continental shelf in the Mid-Atlantic Bight, from Cape Hatteras, North Carolina, to Cape Cod, Massachusetts. Moreover, the species is thought to exhibit seasonal movements, mediated by water temperature, into northern latitudes. 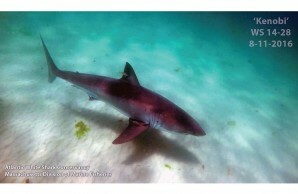 A white shark, looming to the right, is hunting gray seals as they feed off the coast of Cape Cod. 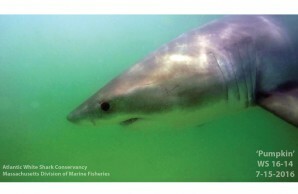 From 1990 to 2009, MSRP recorded 63 white shark sightings, resulting in a total of 50 credible reports. The bulk of these fish (70 percent) were reported by commercial fisherman. The balance (30 percent) were reported by beach users, kayakers, paddleboarders, recreational boaters, and seal-watch vessels. 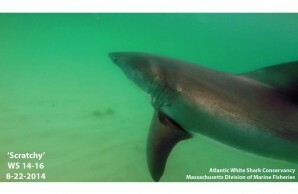 Although white sharks were reported over a broad geographic area north, east, and south of Cape Cod, 26 (52 percent) were in proximity to Monomoy Island. 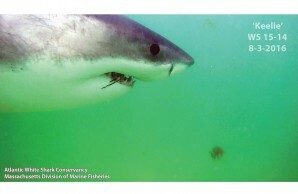 The MSRP found a significant increasing trend in annual white shark counts, and the number of shark-bitten seals has been increasing in the area over the last decade. All of these interactions involved gray seals; and the white shark was the species implicated in the attacks. 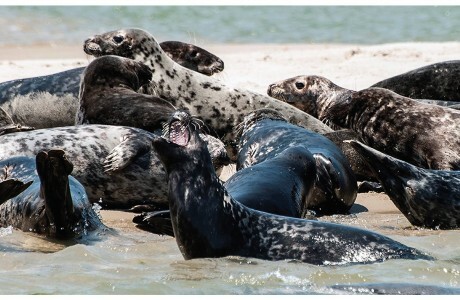 In at least five cases, fishermen or beach goers witnessed the attacks close to the large gray seal colony on Monomoy Island, a large National Wildlife Refuge, stretching 13 kilometers south into the Atlantic from Chatham, Massachusetts. The refuge largely comprises the two barrier islands of North and South Monomoy. Gray seals are most frequently seen on the east coast of the barrier islands and on adjacent shoals from Chatham Harbor to the southern tip. Although counts from formal seal surveys are currently lacking, the number of gray seals using these areas is typically in the thousands. The island is the largest and most frequently used “haul out” for gray seals and is used periodically to pup. Although increased sightings are evidence that the local seasonal population of white sharks off Massachusetts and, particularly, off the east coast of Cape Cod has increased in recent years, it’s plausible that this trend reflects an increase in sighting efforts. 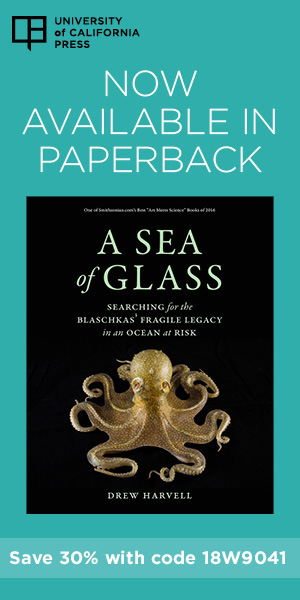 However, most sightings come from commercial fisherman targeting groundfish and bluefin tuna. It has been illegal for fishermen to capture and kill white sharks since 1997. Hence, there has been no incentive for commercial fishermen to report white shark interactions with fishing gear, because it may result in a fine. Moreover, fishing effort and landings by these commercial fishing groups over the last decade have been in steep decline due to struggling fish stocks, restrictive fisheries regulations, and changes in fish distribution. A female gray seal, hauled out on a sand bar in Chatham Harbor, “howls.” A white shark was observed hunting just outside the harbor, causing seals to seek the safety of the sand bar.